‘Mort Aux Vaches’ (Science Museum Object no.544). 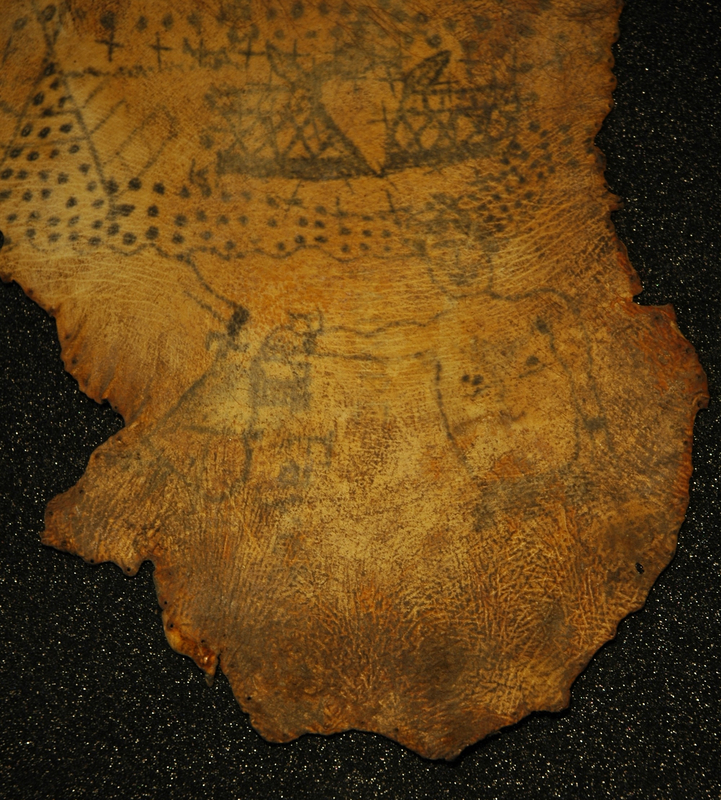 Back in June, I wrote a post about “the wounded tattoo“, one of the larger tattooed skin specimens in the Wellcome Collection. At the time, I was primarily interested in various qualities of the skin that tell a story about how it was preserved, and even which part of the body the skin had come from. However, I feel that some of the very numerous tattoos on this particular specimen also deserve mention. 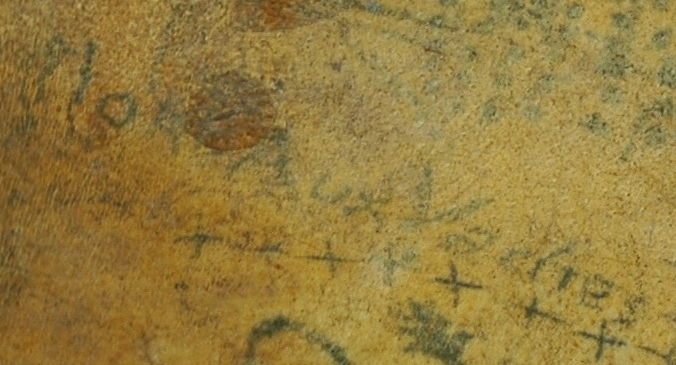 As well as the clues in the shape and texture of the skin, the orientation of the tattoos also suggest that this segment of skin belonged to a left forearm: Above a series of banded horizontal dots, a short ‘wristband’ tattoo is visible, consisting of a decorative pattern of diamonds with a central heart motif. The crude male figure on the back of the hand is also tattooed upright, so as to be presented the right-way-up to others. A number of words and phrases are tattooed vertically down the arm, orientated towards the body in such a way that they would have been legible to the bearer. The most interesting of these reads ‘Mort Aux Vaches’, which translates literally as ‘Death to Cows’. Tattoos over the back of a left hand. (Science Museum object no. A544). In France, a shorthand version of this expression consists of three dots arranged in a triangle, tattooed between the forefinger and thumb. This particular tattoo is amongst the most common gang tattoos around the world, and is particularly popular within the Cuban and Russian underworld. The signification of the three dot tattoo varies greatly depending upon national and historical context, however; it has also been associated with sailors, who would traditionally receive three dots to mark their first voyage. Translated from the French: “On accuse mon client d’avoir dit : “Mort aux vaches!“. Le sens de cette phrase n’est pas douteux. Si vous feuilletez le dictionnaire de la langue verte, vous y lirez : “Vachard, paresseux, fainéant; qui s’étend paresseusement comme une vache, au lieu de travailler”. – Vache, qui se vend à la police ; mouchard. “Mort aux vaches!” se dit dans un certain monde.” Anatole France: L’Affaire Crainquebille, (1901) pp.46-47. © Life & 6 Months. This entry was posted in Criminology, From the Storage Archives, Museum Collections, Tattoo Iconography and tagged 3 dot tattoo, amateur tattoos, criminal tattoos, human remains, L'Affaire Crainquebille, offensive tattoos, preserved tattooed skin, sailor tattoos, Science Museum, tattooed skin collection, Wellcome Collection. Bookmark the permalink.